Astrophotographer Dale Mayotte sent SPACE.com this composite photo of the International Space Station crossing the face of the sun. He took the 19 images that were combined to create this photo from his backyard in Clinton Twp., Mich. at 5:28 p.m. on June 19, 2013. 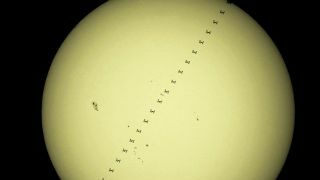 Astrophotographer Dale Mayotte recently sent SPACE.com this spectacular composite photo of the International Space Station crossing the face of the sun. While Mayotte only submitted the image recently, he actually took the 19 photos that were combined to create the stunning composite view of the International Space Station and sun on June. 19 from his backyard in Clinton Twp., Mich. at 5:28 p.m. local time. "This is the one and only time everything worked out perfectly and the wait was well worth it." Mayotte used an 11-inch Celestron CPC telescope with a Baader white light solar filter and a Canon Rebel T1i camera with a yellow filter to give the sun a hint of the color we would see with our eyes. He used the websites Heavens Above for the time and CalSky to learn the path of crossing. "It was a beautiful sight to see and was even more awesome knowing that six humans were aboard traveling 17,500 miles per hour (28,163 km/h) some 200 miles (321 km) above our tiny little world," Mayotte said. At the time of the photo, the space station was home to the six-person Expedition 36 crew, which included NASA astronauts Karen Nyberg and Chris Cassidy, Italian astronaut Luca Parmitano and Russian cosmonauts Fyodor Yurchikhin, Pavel Vinogradov and Alexander Misurkin. Cassidy, Vinogradov and Misurkin returned to Earth last month and were replaced by NASA astroanut Mike Hopkins and cosmonauts Oleg Kotov and Sergey Ryazansky, who launched to the station on Sept. 25.